Dealing with your spouse's attorney can be daunting, but it's his job to represent your spouse to the best of his ability. If you're represented by your own counsel, your personal contact with opposing counsel should be limited. If you're representing yourself, however, you'll be handling all communication about the case yourself. Represented or not, you should know there are some professional rules of conduct opposing counsel has to follow that may make facing down your spouse's lawyer a little easier. Rules of professional conduct prohibit a lawyer in any type of case from speaking with an opposing litigant who has his own representation. That means your spouse's attorney can't speak directly to you if you have your own attorney. If he does, he risks sanctions by the state bar association. The only exception is if your attorney pre-approves the communication. If you are representing yourself, then you are your own lawyer, and communication between you and opposing counsel is necessary to move your case forward. However, communication is likely to be largely in writing so he has documentation of his correspondences with you. When communicating directly with you, whether you are represented by your own counsel or not, opposing counsel must meet honesty and professionalism standards that are required of all opposing counsel by their state's rules of professional conduct. Opposing counsel is specifically prohibited from making dishonest statements or violating rights to procure evidence. Likewise, he cannot delay your case unnecessarily, harass or purposely embarrass you. Your spouse's attorney is required to draft and file all the necessary documents. These include the petition -- if your spouse initiated the divorce; or, if not, these include the answer to the petition that you filed. Documents may also include a financial affidavit, as well as requests to produce certain information or documents. He'll draft your spouse's proposed property settlement and parenting plan, and then he will compare them with yours. If any issues remain unsettled, he'll negotiate in an attempt to arrive at a final settlement. If mediation is required, he'll attend and negotiate with you or your lawyer through the mediator. If a full settlement isn't reached, the divorce goes to trial, at which he'll explain to the court why your spouse should get everything he wants. In support of his argument he may call witnesses, ask questions and present documents. Initial discovery is made up of interrogatories, which are questions; requests for production of documents; and requests for admissions, which require you to deny or admit certain facts regarding the case. The attorney may subpoena you for deposition and require you to bring any missing documentation he previously requested. Depositions and supplemental discovery requests help answer questions that arise during initial discovery. After questioning you, he may contract the services of various professionals, such as a forensic, or investigative, accountant, to further analyze the information you provided. Gregory S. Forman, PC: What is Discovery? What if My Husband Refuses to Mediate the Divorce in Texas? 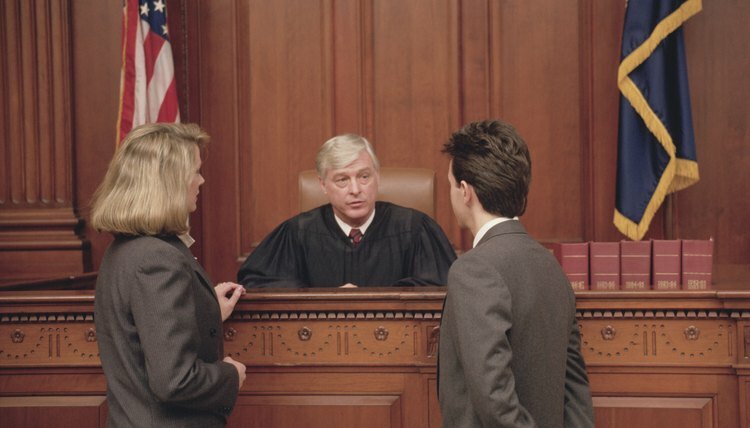 Divorcing spouses in Texas are encouraged to use mediation as a means of settling their disputes. However, state law does not require spouses to mediate unless a judge orders them to do so. In an effort to facilitate settlement of contested divorces, may counties have established local rules that require mediation before the final hearing. The consequences, if any, for refusing to mediate depend on the type of divorce and local rules of the county where the case has been filed. Remembering and following all of the many court rules and procedures can be a challenge, even for experienced attorneys. If your first interaction with the legal system is getting handed divorce papers, it is only natural to feel intimidated. But knowing the basics of how divorce proceedings typically unfold will help you prepare to effectively defend and represent yourself in court. What Happens When Your Spouse Disappears in the Middle of Your Divorce and Is Represented by Counsel? Does a Lawyer Have to Turn In Someone Who Is Committing Bankruptcy Fraud?